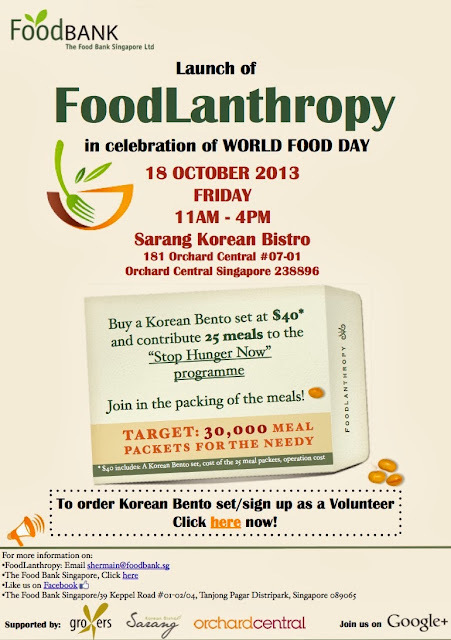 FoodLantrophy - Buy a Korean Bento Set from Sarang and Contribute 25 Meals for the Needy! Food Bank Singapore has launched FoodLanthropy - something that taps into Singaporeans love of eating with raising 180,000 meals for the needy. The organisation lives to help reduce food wastage and channel food donations to those who need it. It hopes that this initiative will help spread the message about these issues too. "FoodLanthropy is a series of monthly dine-outs where people can join us for a meal where part of the proceeds will go to Food Bank Singapore to purchase meal packs under the Stop Hunger Now initiative. Simply put, it’s about doing good with eating and food,” said Nichol Ng, Co-Founder of Food Bank Singapore. Singapore and across the region. World Food Day is on October 16. Food Bank Singapore is targeting to sell 1,200 Korean bentos to cover the cost for 30,000 meal packets. 2. Volunteer for the packing activity of the meal packets at Orchard Central (requires minimum 1 hour commitment). About 200 volunteers are needed for the five hour event.